Calicut pops up in the most unlikely stories. Business Standard reports that many of the victims of the Somalian piracy now raging in the Gulf of Aden are seamen from Calicut! Incredibly, India is reportedly the biggest trading partner of the lawless Somalia, supplying it with essential commodities like rice, pulses, wheat, flour and sugar and helping transport the country's only significant export - goats. The trade is undertaken in large dhows, many of them made in Beypore. And the brave seamen who undertake the trade come from Mumbai, Kutch, Mangalore and - Calicut. And while high profile attacks on Russian and US ships and tankers get world attention and swift naval action, these anonymous victims are often at the mercy of the dhow owners and small time traders of Dubai who would rather cut their losses than spend more money as ransom. Calicut's association with piracy on the high seas is as old as piracy itself. Piracy was recognised as one of the occupational hazards of seafaring. As Biddulph explained, 'There was no peace in the ocean. The sea was a vast No Man's domain where every man might take his prey'. As trade flourished so did piracy. The Indian trade with the Red Sea was paid for in gold and silver and, therefore, ships sailing from Jeddah - which carried pilgrims from Mecca, apart from the treasure - were prime targets. Many of these vessels were bound for Calicut. British government took several measures to contain piracy on the Indian seas. Countries were required to issue passes and East India Company Commissioners were authorised to seize pirate ships and hold them till the King's pleasure. On this morning a ship under English colours stood into Calicut, and when alongside ship struck the English and hoisted Danish colours, fired a broadside, boarded and took her. Her boats then took three other ships. The Governor then came to us with threats and ordered us forthwith to send off to her and ask who they were, whereupon we sent Captain Mason, who returned saying that they were soldiers of fortune and that if the ships were not ransomed for Pounds 10,000 they and the rest of the shipping should be burned. We were well guarded all that night by the Governor's people. This morning the pirate was found to have moved her prizes to deeper water. The Governor ordered us to send off to know if they could lessen their demands. Captain Mason was accordingly sent off with a flag of truce and remonstrated civilly but to no purpose. They said he was no countryman of theirs, that they would not abate of 40,000 dollars ransom, and that unless it was sent off by noon one of the ships would be fired. Captain Mason again went off and offered 20,000 dollars, but they were deaf to it, and at four o'clock set one ship on fire. It was clear by now that the local Governor (presumably representing the Zamorin) was buying time with the English pirates while arranging for an assault by 'Malabar pirates'. The assault started in the night of 25th November. By the evening of 26th November the English pirates had been driven away and the Malabar pirates also managed to rescue Captain Mason, who had been held hostage by the pirates. Captain Mason returned, having been put in a boat by the English pirate which was captured by the Malabar pirates, whereby he was obliged to jump overboard and swim ashore. He brought news that the pirate would cruise for Persia and Bussors ships. He reported her to be of about 300 tons, 20 guns and 100 men, her captain a Dutchman of New York, and that she daily expected a consort of about the same strength under one Hore. They offered him command of the ship if he would join them. He gathered that most of the pirates were fitted out from New York and returned thither to share the plunder with the Governor's connivance. One pirate had presented the Governor with his ship. War with France was raging and there was no way the English naval force could come to the rescue of its merchant fleet. It was thus that some influential persons in London including the Chancellor, Lord Somers, Lord Orford and Lord Bellomont (who had been designated the Governor of New York)formed a syndicate and obtained a letter of marque for privateering to tackle the menace of piracy. It was rumoured that King William himself had a ten per cent share in the syndicate. They obtained a commission for Captain William Kidd to act against the pirates with a reward of 50 pounds for every captured pirate. But soon it was revealed that Kidd had other ideas. From a tormentor of pirates he turned out to be the biggest pirate of them all, attacking English, French, Dutch and native ships without discrimination. His activities on the Malabar coast hurt English trade interests most and soon the entire 'syndicate' episode turned into a stinking political scandal. Captain Kidd had visited Calicut in October 1697, apparently to seek replenishment of 'wood and water', but his reputation had preceded him and the Company authorities politely refused him, although he tried to browbeat them with authority of the King's Commission. Turned away from Calicut, Kidd sailed on towards the Laccadives. His last daring act was the capture of the ship Queddah Merchant. Fate caught up with Kidd and he was arrested at the behest of his own mentor, Lord Bellomont who had by then taken over as the Governor of New York. The good Lord who had shared of Kidd's booty tried to distance himself from the pirate, claiming that 'I secured Captain Kidd last Thursday in the Gaol of this Town (Boston) with five or six of his men... It was true the King had allowed me a power to pardon pirates. But that I was so tender of using it (because I would bring no stain on my reputation) that I had set myself a rule never to pardon piracy without the King's express leave and command'. This pompous statement came after Bellomont snatched from Kidd the only piece of evidence (the French pass issued to Queddah Merchant) which could have saved Kidd's life! Perhaps Bellomont was hinting to the King that he could bail out his former business partner. 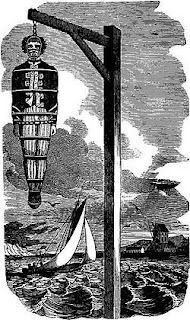 But this did not happen and Kidd was tried, convicted and hanged at Execution Dock (on the Thames, at Wapping) on 23rd May 1701. If there was honour among thieves, it was only Kidd who demonstrated it - he did not disclose the names of his powerful patrons, despite close questioning! While all this was happening, the Zamorin was the powerful Bharani Thirunal (1684-1705) who has been described as 'the terror of the Dutch'. He was perhaps still stationed in Ponnani and even found time to conduct two Mamankams in 1694 and again in 1695. The Governor mentioned in the narration of pirate attack must have been the Kozhikkode Thalachannavar who must have been the de facto Governor of Calicut. But, who were the 'Malabar pirates'? Is it a reference to some local naval force which must have been restructured after the cruel betrayal of Kunhali Marakkar? Or did the Shahbandar Koya have his own rapid action force? The ancestors of the pirates of Somalia were from Calicut or the pirates themselves are from Calicut? Enjoyed reading this account. I think the referencxe to Calicut is merely symbolic as far as Somalia is concerned. Thanks CKR for this account. Captain Kydd's adventures are quite interesting by themselves and have created a legion of fans & piracy stories & movies..people still hunt for his treasure. Nikhil - The article starts by explaining that Calicut seamen in dhows (transporting essentials to somalia) are victims of modern day Somali pirates. Now I hope the connection is clear. PNS- thanks. But the Calicut connection is not symbolic. We have no authentic figures but the number of poor fishermen and other sea workers who are routinely harassed by the pirates is substantial. Many of them have no proper travel documents and therefore no diplomatic representation. Yes, Maddy, Capt. Kidd has spawned a virtual deluge of adventure stories from Defoe to Stevenson to thousands of others all looking for the hidden treasure. The jury is still out on whether Kidd was all that scheming and cruel pirate as has been made out or whether he was the victim of a clever conspiracy by the British nobility to make a quick fortune from the disturbed maritime environment. Hi, I am very interested in more details abt Aidid's extended family in Calicut. Please post the story. Fascinating!